A Rover search page generated with a dxIDXPress shortcode! We are happy to announce that Rover IDX will recognize Diverse Solutions dsIDXPress shortcodes and IDX Data Filters! So you can replace dxIDXPress with Rover IDX without having to worry about modifying shortcodes or Data Filters on all your search pages. This is a huge time saver! Rover IDX translates the DS parameters, and the results are stunning. If you have 30 search pages already prepared, when you enable Rover, those pages will work! 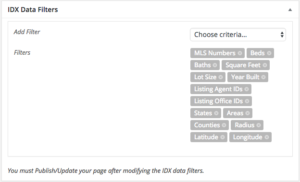 Rover IDX even understands IDX Data Filters - those easy to add instructions that can be added to a page and define what type of listings should be displayed. All you need to do it upgrade to the latest Rover IDX release, disable dxIDXPress, and activate Rover IDX. Voila! 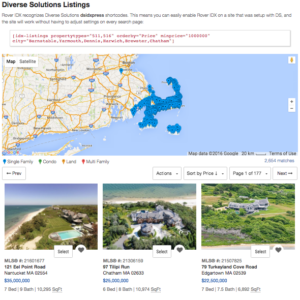 Searchable listings and active pages, lead capture, and stellar SEO. And this time, you have the confidence of Rover IDX.